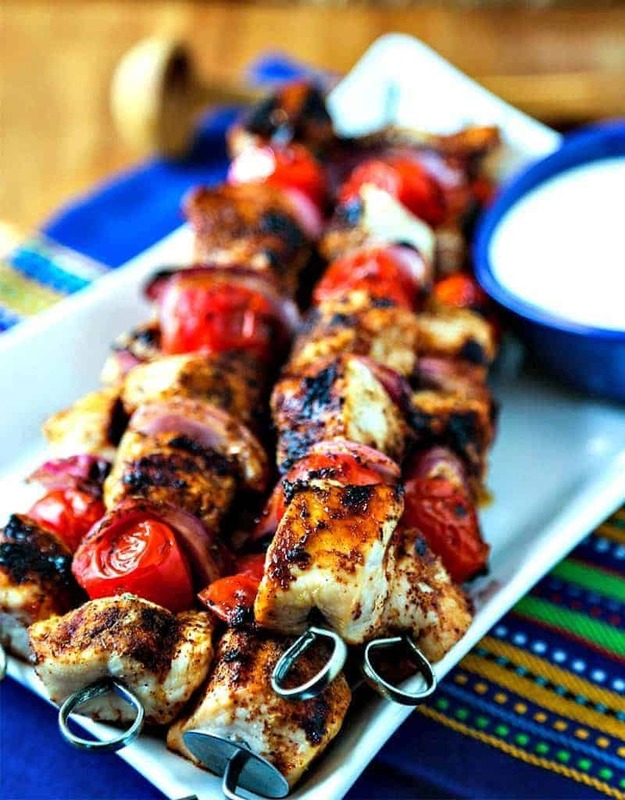 This quick and easy chicken kabob recipe just couldn’t get any easier to prepare. Not only is it delicious, it doesn’t require any special ingredients! A little bit spicy, and a little bit sweet, Smoky Chicken Kabobs are perfectly complimented by a tangy, homemade white barbecue sauce. While the base of the white barbecue sauce is mayonnaise, white vinegar adds the tang and fresh garlic gives the sauce a little punch. 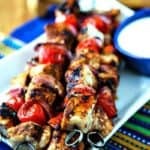 Most chicken kabobs for the grill require marinating time, but that’s not necessary for this chicken kabob recipe. Just sprinkle with dry rub, grill, and serve! I’ve been making a conscious effort lately to cut down on calories where I can without sacrificing flavor, so I used reduced-fat olive oil mayonnaise in this white barbecue sauce recipe and saved a third of the fat and calories of regular mayo. Not only were these kabobs and sauce extremely tasty, I could enjoy eating it without all the guilt! Every little bit counts, right? Mix together the dry rub ingredients—a few spices, dark brown sugar, and chili powder (see detailed recipe below). For a really smoky flavor, I suggest using chipotle chili powder or a smoked chili powder, but regular chili powder works just fine as well. Fire up the grill to medium high heat. Thread chicken chunks and veggies onto metal skewers. I used cherry tomatoes and red onion, but you could also use bell peppers — use whichever is your preference. Generously sprinkle the dry rub over all the chicken and veggie kabobs and grill for about five minutes on each side. I tell you, it doesn’t get any easier than that! With just 15 minutes of prep time required, these Smoky Chicken Kabobs can be on the table in just about 30 minutes. Serve with a green side salad and a baked potato for an easy Summer outdoor picnic! 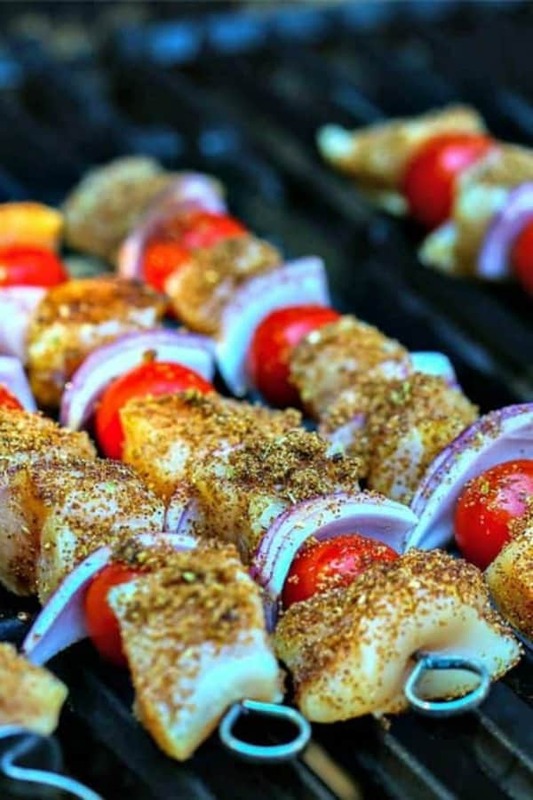 DID YOU MAKE THIS SMOKY CHICKEN KABOBS RECIPE? No marinating required for these easy Smoky Chicken Kabobs. Sprinkle with dry rub, grill, and serve with a tangy White Barbecue Sauce. In a small bowl, stir together ingredients for the BBQ rub and set aside. In another small bowl, whisk together ingredients for the White BBQ Sauce. Refrigerate until ready to serve. Preheat grill to medium high heat. Cut chicken into 1=inch chunks and cut red onion into quarters and separate the pieces. 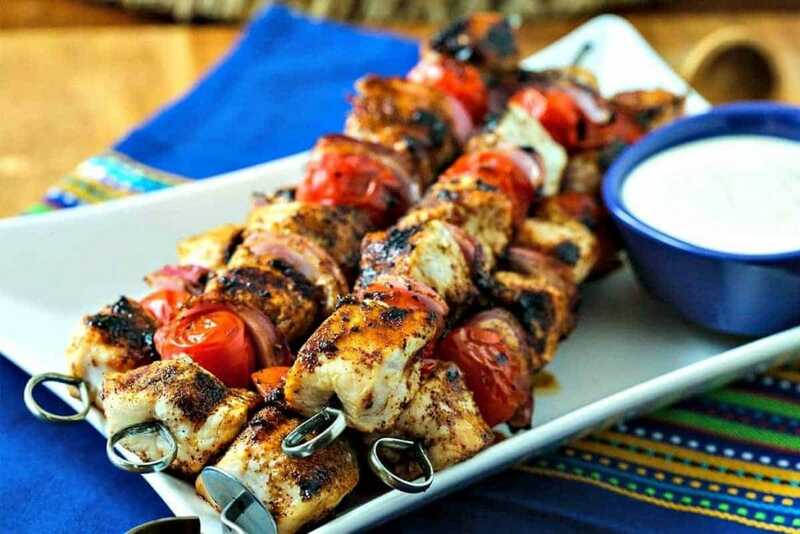 Thread chicken, onion, and cherry tomatoes on 8 metal skewers. Sprinkle the BBQ rub evenly over the kabobs. Place on oiled grill grates and cook with the lid closed for about 5 minutes on each side, turning often as the sugar may tend to burn. Serve immediately with White BBQ Sauce.